Where has January gone?! It’s hard to believe it’s almost February – of course, the weather is reminding much of the country that it’s still winter! With Valentine’s Day approaching, I wanted to share an easy dessert idea. 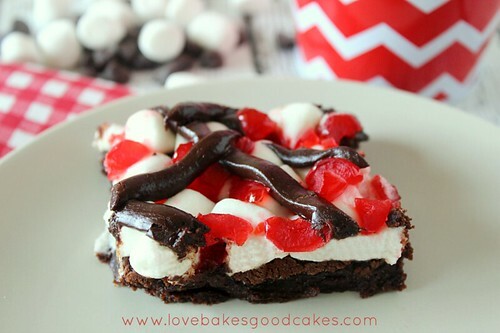 These Chocolate Cherry Marshmallow Brownies are eye-catching with their bright red, white and dark brown colors! This is one of those recipes I tried years ago and tucked it away to make again … and promptly forgot about it! Don’t you hate when you do that?! I was going through some paperwork recently, and found this little gem. I remembered how great it was years ago – and knew I had to make it again and share it with y’all! Preheat oven to 350°F. Spray a 9×13-in. baking pan with cooking spray and set aside. In a large bowl, cream the sugar and butter. Add the eggs and beat until thoroughly combined. 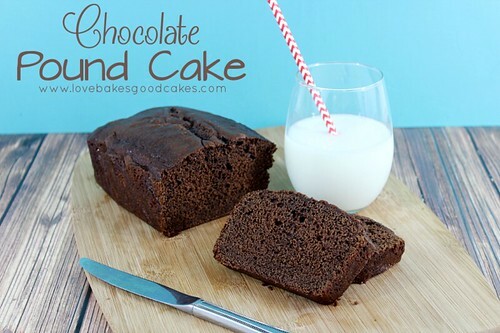 In a separate medium bowl, combine the flour, cocoa powder, baking powder and salt. Gradually add to the creamed mixture. Pour and spread the mixture evenly into the prepared pan. Bake for 28 minutes. Remove from the oven and sprinkle with the marshmallows. Bake an additional 2 minutes or until the marshmallows are softened, but not browned. Remove from the oven. Sprinkle with cherries and allow to cool on a wire rack. In a microwave-safe bowl, melt the chocolate and cream. Stir until smooth. Drizzle chocolate over brownies. Let stand until chocolate is set! Cut into squares. I almost licked my computer screen!….Definitely worth saving this and using this recipe! Jamie, Everything you make looks so delicious! Pinning! Oh my goodness, these look incredible! I love the pops of red from the cherries. This would be a perfect Valentine's treat! I think I will put it on the dessert menu for that night. Oh my goodness! Now I've got to go find some chocolate! Great recipe and beautiful photographs! Your brownies look yummy Jamie! Thank you for bringing them to Family Fun Friday! Blessings! 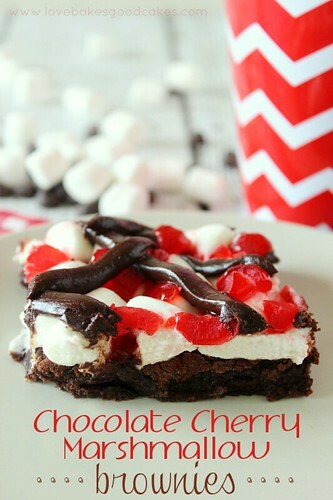 I just pinned your amazing Chocolate Cherry Marshmallow Brownies. Thanks so much for sharing with Full Plate Thursday and have a great weekend! Those look so yummy!!! Thanks for sharing. Three of my favourite things in one dessert. Sounds like a winner to me. Thanks for sharing at Simple Supper Tuesday. Have a great week, Jamie! Jamie, these look just wonderful! I for one have a sweet tooth, so I would eat these up in a day! These are so beautiful! My kiddos would LOVE them. Gonna pin this now. Thank you so much for linking this recipe up at Recipe Sharing Monday. I hope to see you back next Monday. Have a good weekend! These sound delicious….and they're so pretty with the white and red!! Perfect for Valentine's Day 🙂 Thanks so much for sharing at Saturday Night Fever – pinning!! They look fun and great for valentines. Thanks for linking up to Sweet and Savoury Sundays, stop by and link up again this weekend. So many recipes to keep up with! Yes, I find recipes shoved in folders and drawers all the time and think, "hey I wanted to make this again!" Glad you found this one. My son is too. He picked it to feature this week. 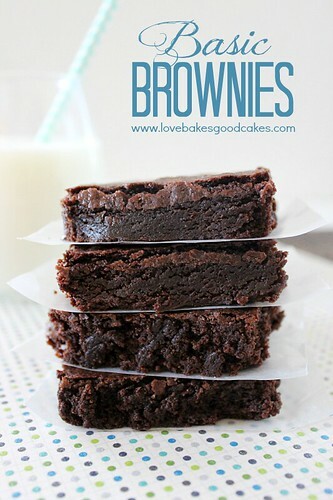 I can't stop drooling…..I LOVE these brownies and just gave this great post a shout out! Happy Thursday!